An Arizona woman completed her college diploma at the grand old age of 102, more than 59 years after she started taking classes, has died, less than two months after graduating. 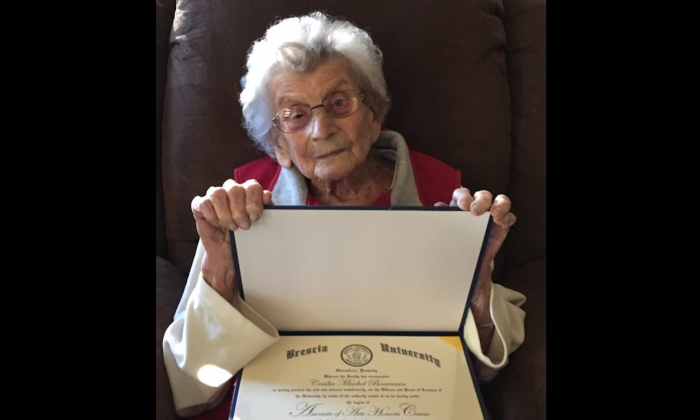 Cecelia “Dolly” Mischel Boarman was 102 years old when she received her Associate’s degree from Brescia University on Feb. 8. On the day before she died, Boarman was shown a copy of a newspaper, where her story had made front page. I read the article and showed her the picture. At that point, she was starting to fade. Boarman first began taking classes at Brescia University in her hometown of Owensboro, Kentucky, in 1957. She later became a teacher at parochial schools. She was allowed to teach even without a degree as long as she was taking classes toward a degree. In 1969, she took her final course, but never took her bachelor’s degree. I am so thrilled to finally get a diploma after all these years. Boarman led a tough life. Her husband died shortly after they married during WWII, and she raised her daughter as a widow. When her daughter Fine was scheduling an alumni visit to Brescia, which she also attended and graduated from, she told the administration about her mother’s story. Pulling up Boarman’s transcript, the school administration saw that Boarman had enough credits, and awarded her with a honorary Associate’s degree.